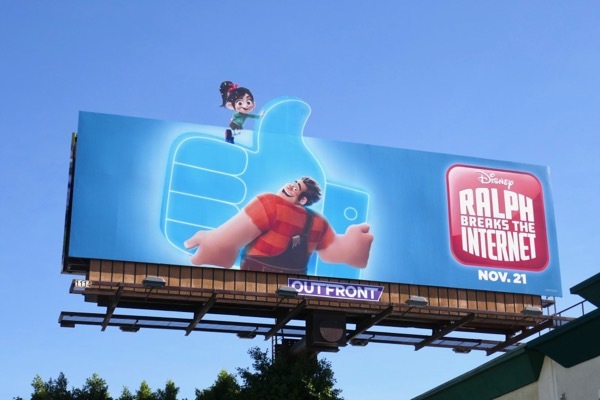 The dark web, fake news bots, viruses and trolls, the internet can be a scary place at times, but the online world hasn't met Wreck-It Ralph until now. 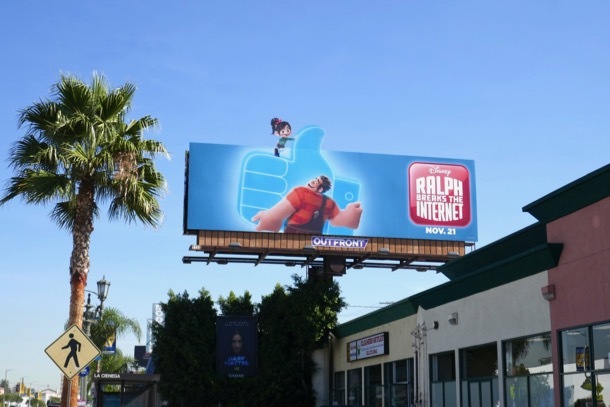 Disney's lovable bad guy-turned-hero arcade game character is back to wreak havoc once again with help of his gutsy best-friend 'Vanellope von Schweetz'. 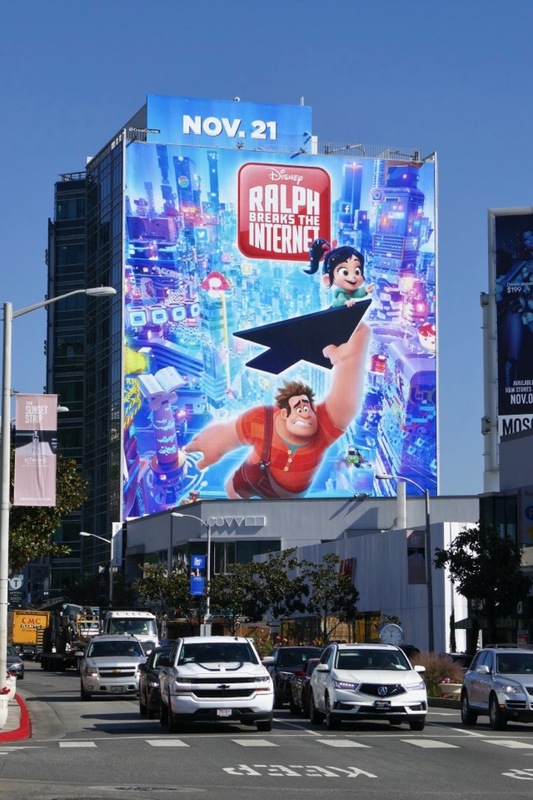 Voiced respectively again by John C. Reilly and Sarah Silverman, the duo venture into the wilds of the World Wide Web for a whole new animated adventure. 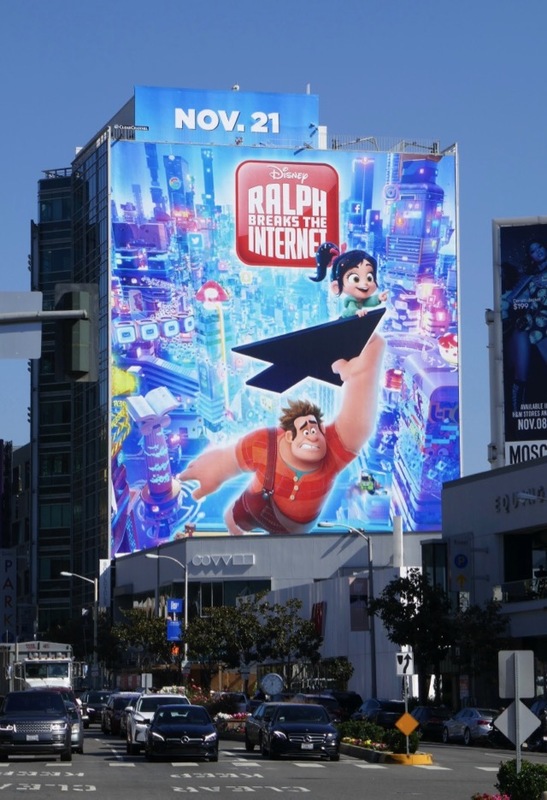 The first film introduced us to the nostalgic world of arcade and video game characters, this time around the odd pairing have the whole virtual world at their fingertips, including meeting all the iconic Disney Princesses, on a quest to find a part to repair a classic arcade game. 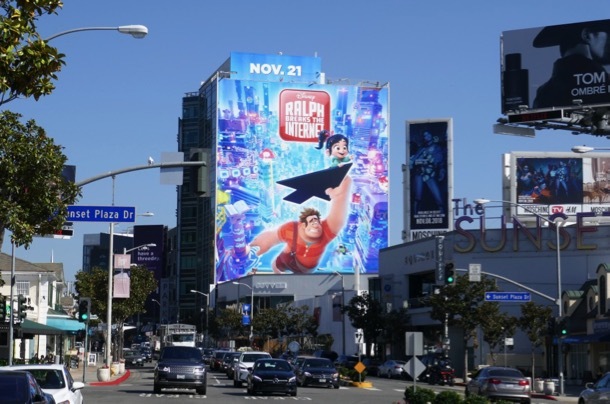 These vibrant billboards for the movie sequel were snapped along Barham Boulevard, Wilshire Boulevard, La Brea Avenue, Pico Boulevard, Beverly Boulevard, Cahuenga Boulevard and the Sunset Strip from October 11 to November 9, 2018. 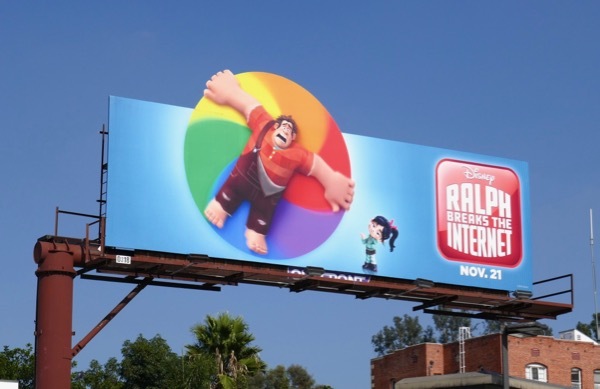 The ad creatives are a lot of fun with their computer and social media iconography of floating cursor arrows, spinning wait wheels and like symbols. 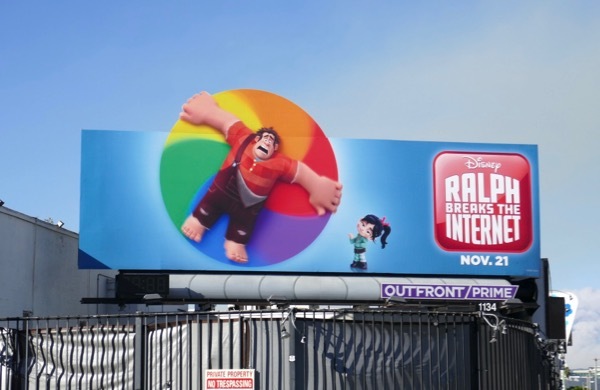 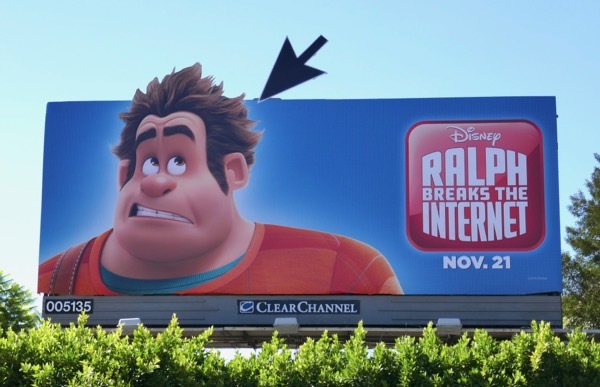 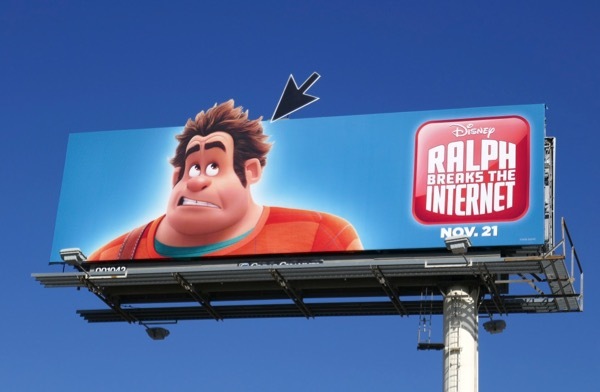 Fans of the animated Disney characters can also enjoy these Wreck-It Ralph movie billboards from 2012. 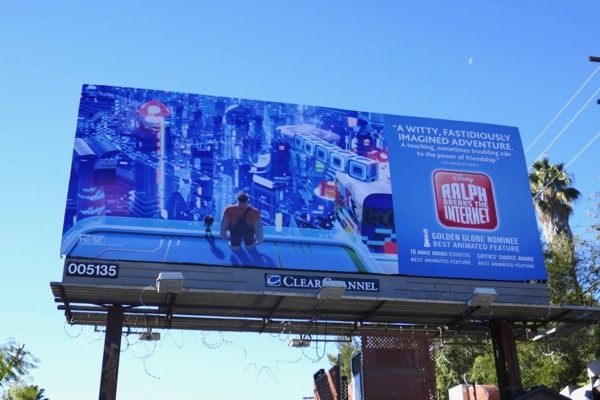 Plus Mouse House aficionados can also enjoy all these other cool Disney movie billboards entertaining L.A.'s skies over the last ten years. 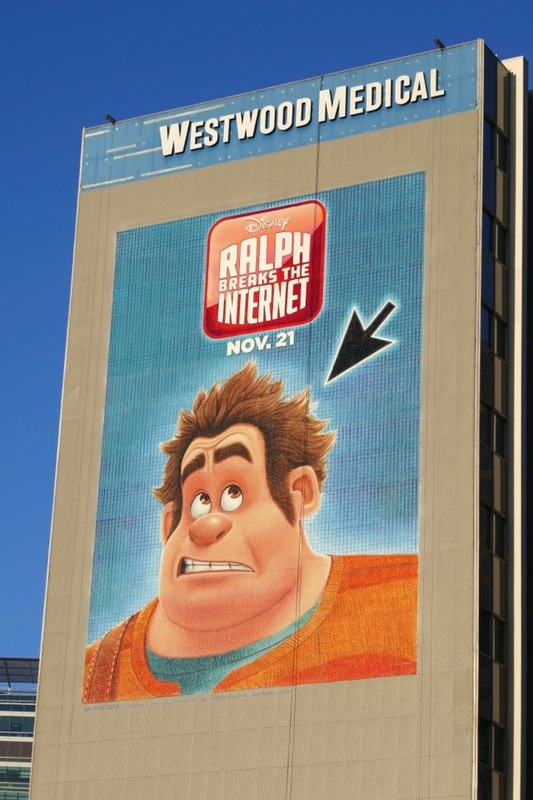 Wreck-It Ralph 2 would have been a boring name and Ralph Breaks the Internet is much more topically relevant, so let's see if this new motion picture can wreck expectations and dominate the box office this Thanksgiving. Stay tuned in the coming days for even more great movie billboards trying to attract passersby attention around L.A. in our latest themed FILM WEEK. 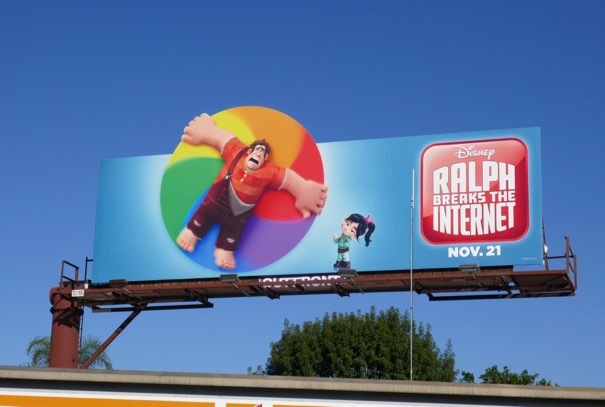 UPDATED: Here's also another look at the spinning wheel ad creative on a clear day in L.A. 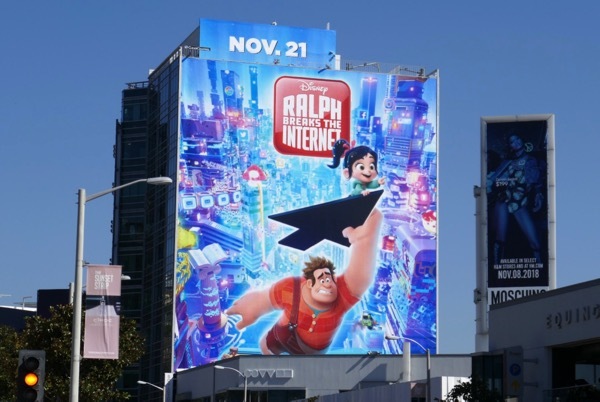 UPDATED: Congratulations to Ralph Breaks the Internet for being nominated for the Golden Globe for Best Motion Picture - Animated. 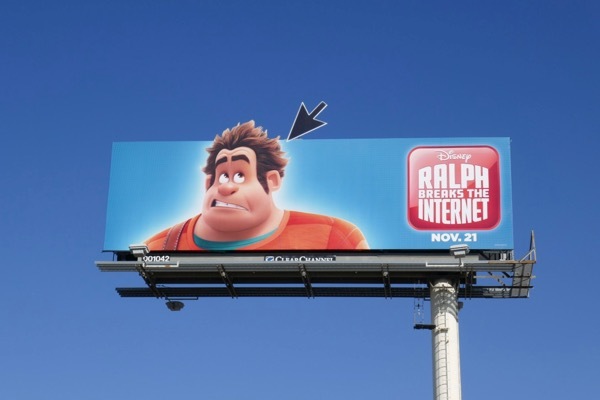 This nominee billboard was spotted along Barham Boulevard on December 29, 2018.